Bugaboo Shoe Co. was created after the owner’s searched high and low for the right shoe for their daughter. All of the shoes they found in their price range were either made out of man made materials which caused their daughter’s feet to sweat excessively or had inflexible soles that their daughter refused to walk in. They decided to make their own shoes and so Bugaboo Shoe Co. was born! Bugaboo Shoes are fashionable shoes made of high quality leather with a pliable rubber sole that provides traction all at a reasonable price. 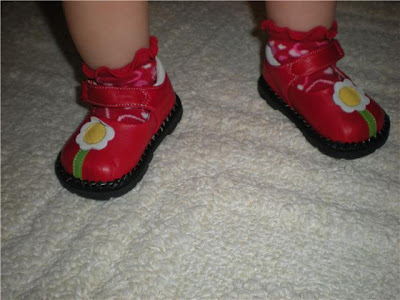 Bugaboo Shoes sells the cutest toddler and children shoes. These shoes are for little girls and they are called Lola Lu. I think they would be perfect for Spring and I love the colour. Bugaboo Shoe Co. sent me a pair of red Josie shoes for my review. The Josie is their classic design made of lambskin leather with a pliable sole needed for developing feet. My niece Avery got to try out these shoes and let me tell you they look so darn cute on her!! Both my sister Laura and I thought that these shoes were the softest leather we had ever felt. I love that they aren’t man made and Avery’s feet won’t get all sweaty and gross wearing these shoes. Avery has just started to walk. She’s 10 months old and has taken 10 steps on her own so far. I like knowing that these shoes will offer her traction and flexibility. The cost of the Josie shoes is $32 which is a reasonable price and you get your money’s worth in my opinion. Bugaboo shoes are well made of high quality materials, practical and of course, very stylish! Bugaboo Shoe Co. has a special offer for my readers! They are offering FREE shipping on your first order. Please enter Canada in the coupon code at checkout to take advantage of this special offer.